Do you want to keep your dog happy and healthy? All of us dog parents love our canine friends way too much and want to provide them with the best possible kind of life. Food is perhaps one of the most important domains when it comes to this! In today’s blog, I’d like to help you find out the best dog food for poodles. After all, your dog may love food, but the food has to love your dog back in order for him to grow and thrive! In this section of the blog post, I’d like to share the names and ratings of the dog foods that I’ll be going through in detail later in this blog post. Keep in mind that these dog foods have been selected keeping the nutritional needs of your dog in mind. I’d like to talk about a few important considerations before I go into reviewing the dog food for you. The Poodle Problem: Three’s a Crowd! You shouldn’t mindlessly pick up just any dog food for your furry friend. So, you can’t just buy any breed-specific dog food without double-checking the breed. The nutritional requirements of small-breed dogs such as the Toy and Miniature Poodle are far more different than that of a standard Poodle. Because of the small size, these dogs have a faster metabolism and require food high in nutrition for their higher need for energy. The small size of the dog also means a smaller stomach! So, that’s why the food pellets designed for smaller dogs are bound to have more nutrients as compared to that of a regular-sized dog. This means that the dog gets the calories he needs without having to eat way too much. Not only do you need to choose the right kind of food for your small breed dog, you also have to ensure that you feed your Poodle at the right times as well. Even though Poodles are known to be a fairly healthy breed, there are a few health ailments that they’re genetically predisposed to. Now, keep in mind that your Poodle may not necessarily have any of these problems but, I feel that it is wise to keep them in mind while tweaking their diet. Known as the Addison’s Disease’, this condition occurs due to a problem in the functioning of the adrenal gland. This can even lead to death if it’s not diagnosed in time and treated. Studies suggest that the consumption of foods like corn, soy, and wheat should be avoided and raw, animal-sourced food should be preferred. Another health ailment common in Poodles is Hyperadrenocorticism which is due to the dog’s body producing excessive amounts of cortisol. If you see any of these symptoms, you should immediately consult a vet. To help reduce the chances of this disease, it is recommended that you reduce the fat consumption of your furry friend and feed him a diet rich in antioxidants. Diet plays a really big part when it comes to your dog’s health. Try to feed your dog the right kind of food and ask your vet about the nutritional requirements of your dog to make sure you’re feeding him right. Before making any changes or tweaks to your furry friend’s diet, please make sure that you consult your vet! Young pups (smaller than 3 months of age): You should leave food out for the pup at all times but also make sure that it is fresh—don’t keep topping it off! And, also make sure to rise and clean the bowl on a regular basis. Older pups (over 3 months): You can start putting your pup on a feeding schedule and feed your furry companion thrice a day. We all know how important treats are for dogs! So, you should also keep them in mind while feeding your furry friend. Keep in mind that you should allocate 80% of your dog’s daily caloric needs to food and the rest 20% calories should come from treats. Each and every dog has different nutritional requirements and Poodles are no exceptions. You should definitely not rely on online macro calculators or nutritional guides at all because they sometimes are far from accurate. Well, your veterinary doctor is perhaps the best person that you can turn to when it comes to determining your dog’s diet as they’ll give you an accurate amount of macros you should be feeding your dog. Don’t worry, I’ll help you out in making sense of this data! Let’s finally take a look at the best dog food for Poodles, shall we? So if we look at just the ingredients, I feel that Hill’s Science Diet Active Longevity Chicken Meal is an average dry dog food. I feel that the ingredients in this kibble are of good quality and make it be a good option for your furry friend! We also need to look at the number of macros that this dog food contains in order to be able to make a better and well-informed judgment. Confused about what this means? Well, I know that you aren’t a nutritionist and so I will help you make sense of these numbers. 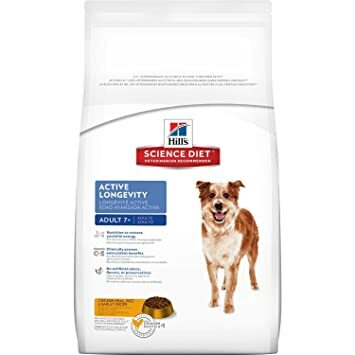 I feel that this dog food is a good choice for smaller and more active Poodles as compared to those who live a sedentary lifestyle or the Standard Poodle. There, however, is another thing that we need to assess before we make the final judgment about this dog food. The meat content, of course! Since dogs are carnivores, they really don’t do very well when fed a strictly plant-based diet. So, the content of meat that the dog food contains is important. Let’s see where the Hill’s Science Diet Active Longevity Chicken Meal stands, shall we? While keeping the protein-boosting effects of ingredients such as corn meal, peas, and flax seeds, etc. this kibble contains only a limited amount of meat in it. Now, it’s time to look at the pros and cons. I honestly feel that this kibble is one of the best dog food for Poodles especially the active ones. While just assessing the Royal Canin Breed Health Nutrition: Poodle dog food by just the ingredients, it looks like an above average dog food product. Let’s take a look that the macros, shall we? As always, I’ll help you figure out what these numbers exactly mean—after all, you’re not a nutritionist! Looking at these numbers I feel that this dog food is definitely a good choice for your Standard Poodle. However, there’s one more thing that we need to go through: the content of meat. Singling out the protein-boosting effects of ingredients such as the corn and wheat, this kibble still contains a moderate amount of meat in it, which is always a good thing. It is finally time to weigh the pros against the cons and see exactly where this dog food stands. 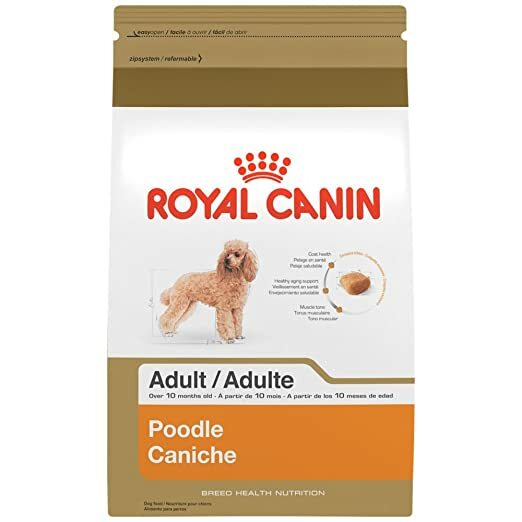 I honestly feel that Royal Canin Breed Health Nutrition: Poodle is a good choice for your Standard Poodle. Share your thoughts or experiences about this dog food in the comments section below! When we assess the Eukanuba Adult Dry Dog Food by just its ingredients then, it comes out to be an average kibble when compared to all the others available in the market. As you may have already figured out, we don’t just look at the quality of the ingredients to determine whether or not a dog food is worth investing your money in. Let’s not take a look at the macronutrients, shall we? Keep in mind that you should ask your doctor the ideal ratio of macros that you should be feeding your doggy friend. Well, I’ll sort that right out and help you understand what they exactly mean. I feel that this is a good option if you have a furry Standard Poodle. However, there is one more important thing left to go through before we make a final judgment. You guessed it! The meat content! 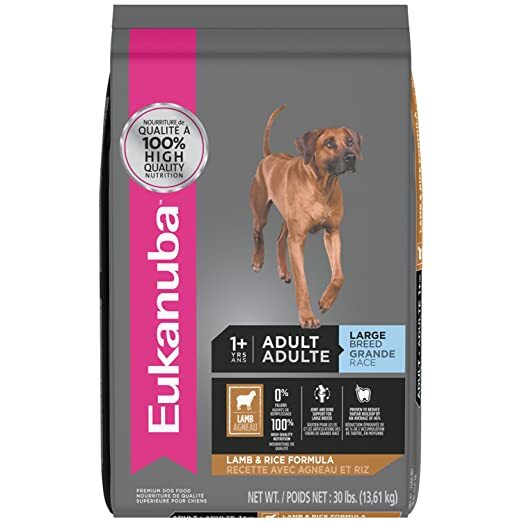 When we try and single out the content of protein in yeast and flax meal then, Eukanuba Adult Dry Dog Food contains a moderate amount of meat in it. Now there’s one more thing we need to go through. I feel that pros and cons of a particular product always help you make the right decision about almost anything that you’re looking at. Let’s take a look at the pros and cons now, shall we? Summing up, I really feel that the Eukanuba Adult Dry Dog Food is one of the best dog food for Poodles as it contains the right amount of macros and good ingredients. 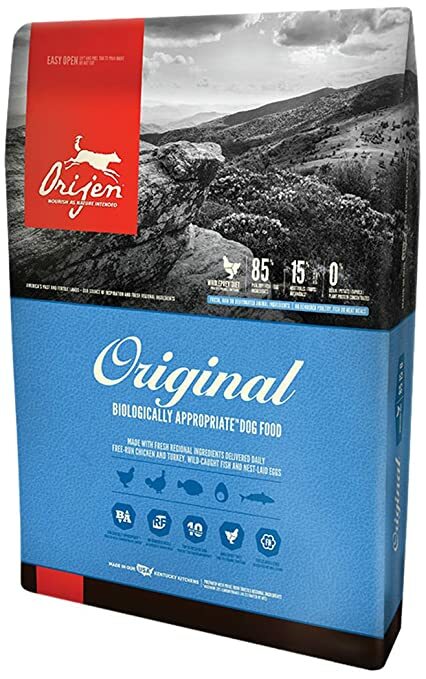 So if we look at just the ingredients, I feel that Orijen Original Dry Dog Food is an above-average dry dog food. What this essentially means is that this dog food contains quality ingredients. Let’s just clear things out once and for all, shall we? I feel that this dog food is better suited for the smaller breeds. However, you should always consult your vet before making any tweaks to your dog’s diet. We aren’t done assessing this dog food yet! There is one more thing that we need to go through: the content of meat. Singling out the protein-boosting effects of ingredients such as the alfalfa and legumes, this kibble still contains an abundant amount of meat in it, which is always a good thing. Isn’t that value for money!? However, there’s one last thing we need to go over. We also need to weigh the pros against the cons. So, without further ado, let;s get talking, shall we? I really feel that this is one of the best dog food for Poodles as it contains a notable amount of meat and a really good amount of macros as well. 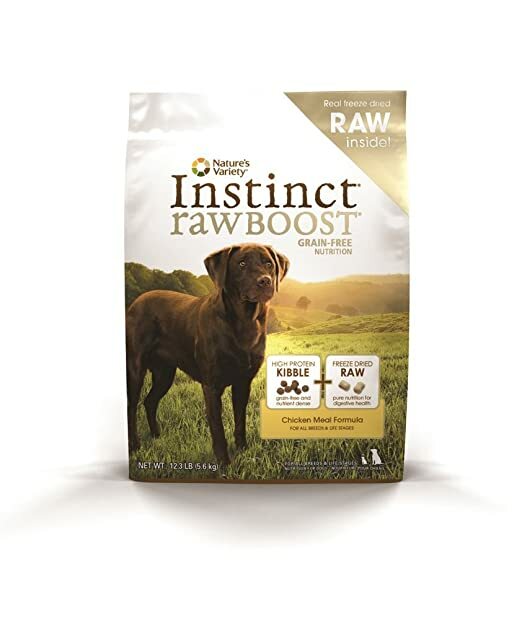 When we assess the Nature’s Variety Raw Boost Grain Free Dog Food by just its ingredients then, it comes out to be an above-average kibble when compared to all the others available in the market. However, that’s not all that we assess. Let us first go over the macronutrients that this dog food contains, shall we? Looking at these numbers I feel that this dog food is definitely a good choice for a Standard Poodle. There’s one more thing that we need delve into the content of meat. And, finally, now is probably the right time to go through the pros and cons. So let’s take a peek, shall we? I hope I helped you find the best dog food for Poodles. At PetDt, we aim to pick the best some amazing dog food options and make sure that we select the ones that contain just the right amounts of macros that your dog would need. Eating just kibble, however, can get boring for your doggy friend! I encourage you to feed your dog olives, bell peppers, tuna, etc. as treats as well! Make sure that you never have to compromise with the quality of dog food that you feed your furry friend—after all, the right food means that your furry friend would stay healthy and live longer. If you are looking for more options, consider organic food or if you’re up to a kitchen adventure, homemade meals! Always keep your cuddly Poodle your top priority! Did I help you find the best dog food for your Poodle? Let me know in the comments section below! And, please don’t shy away from leaving a comment if you have any unanswered questions or concerns. Feedback is always welcome as well!